Interesting blog post by Steve Wexler of Data Revelations. Long article, long title: “Circles, Labels, Colors, Legends, and Sankey Diagrams – Ask These Three Questions”. The really interesting part for the Sankey diagram aficionados is Steve’s advice on when to use Sankey diagrams, and when you should avoid using them. A combination of a stacked bar chart with a distribution diagram, nicely decorated with a trumpet … “Within this context, this very creative chart works”, Steve writes. 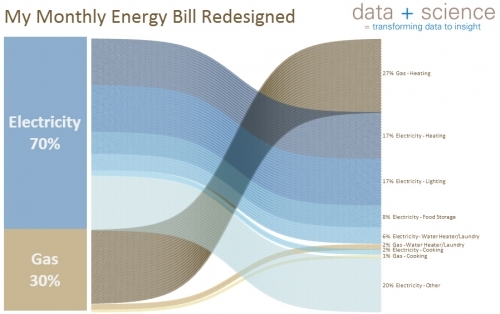 In this case, Steve concludes, the choice of a Sankey diagram is maybe not that wise, since the actual important information (44% of energy cost is for heating) doesn’t really come across quickly and clearly. A bar chart might work better here. Sankey diagrams can create a “cool!” or a “crap!” response, depending on the context. See the original Shaffer post here.